Realizing Hulk-bot is draining all energy it’s hit with, even kinetic energy, the Thunderbolts try to plan their next move. But the arrival of the “Lightning Rods” distracts Moonstone enough that Hulk-bot grabs her, draining her energy. It explodes to reveal Graviton, returned from a microuniverse (DC’s The Atom visits those all the time and Marvel’s version of Micronauts came from one) by the energy from the Hulk-bot, who manages to take down both teams. Even the arrival of Atlas, dealing with his brother’s death and vowing not to run again, isn’t enough to stop him. Moonstone instead uses a psychological tactic to convince him to stop…but how long will that last? Meanwhile, a new Citizen V shows up, also claiming to be the grandson of the previous one despite him not having children, never mind grandchildren. He’s also wearing the costume Zemo once had. He does managed to chase off Zemo and destroy his castle. But he’s not done humiliating Zemo…or the Thunderbolts! What they got right: It was cool seeing a battle end not by fists but by reasoning. And not necessarily convincing Graviton to become a good guy but by making him think about what he actually wants. I also like the idea of this newest Citizen V and I’m curious to see what becomes of him. What they got wrong: Can kinetic energy be used directly as a power source? Really, I don’t know physics well enough to know, although I’m pretty sure potential energy can’t be. I ask because I’m not sure kinetic energy itself (perhaps the energy resulting from using it) can be used to energize Zemo and Techno’s Hulk-bot teleportation thing. 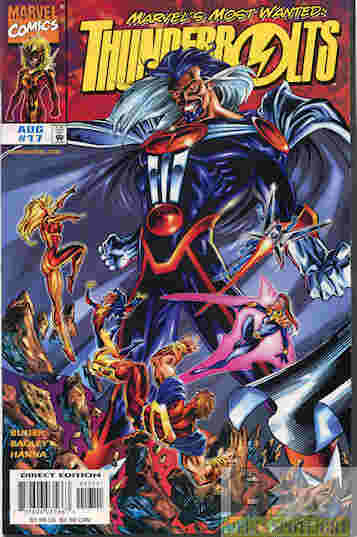 The surprise reveal of Graviton is ruined by him being right on the cover though. Recommendation: A really good story and now the team is back together. Give the issue a look. Posted by ShadowWing Tronix on April 10, 2018 in Marvel Spotlight, Yesterday's Comics and tagged Baron Zemo, Citizen V, Graviton, Great Lakes Avengers, Moonstone, Thunderbolts.